Your Squirrel wants to have fun with his Pull-Ups®, so help make this happen right from the start. At the store, let him choose which designs he’s going to use, and when you get home, let him help open the package. "Do these go on your head? Nooo... Do they go on your elbow? Where do they go and what do they do?" Help your child play with the process of understanding what Pull-Ups do and what they’re for. Maybe your Squirrel would like to try on Pull-Ups right away? That’s fine, but don’t push; maybe she’d prefer to help you stack them in a drawer or on the shelf like blocks so they’re ready to use later. Here are a few games you can play to get your child even more comfortable with the potty training process. Since Squirrels love to play, engage your child with a “Pull-Ups Scavenger Hunt.” Hide items such as Pull-Ups,Big Kid* Flushable Wipes and even a potty chair around the house or playroom, and have your Squirrel suss out where they are. Then, together you can find special places to stash these new potty essentials. Another helpful tool is the “Which Is Faster: Diapers vs. Pull-Ups?" game. Your child is always in motion, and you can use this to your advantage. 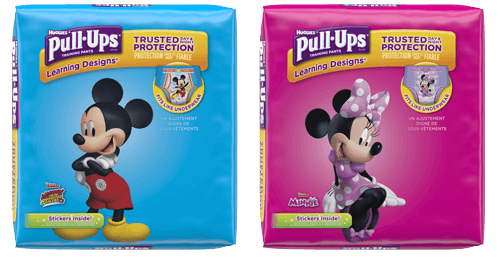 This game allows your child to see that wearing Pull-Ups can help her speed up the process in the bathroom so that she can get back to playing sooner. When it’s time for a diaper change, start singing your child’s favorite song. Put on Pull-Ups once she’s all cleaned up -- then stop singing. Talk about how far into the song you got. Next, ask her if she wants to play the Time to Go Potty race. “Want to race and see if you can do it faster if you use a Pull-Ups? Let’s see if you can beat our diaper change time… Ready, Set, Go!” While you’re singing the song, have your child race to the potty, pull down the pants and Pull-Ups and sit on the potty.“Wow! Look how much faster that was. Using Pull-Ups is much quicker than using a diaper." Potty training is a big moment — it’s when your little one becomes a Big Kid. So it’s important to reinforce this change, and there are a couple easy ways to do so. First, be consistent. When you take your kid out of diapers, keep him out of diapers. Pull-Ups are more than a training pant. They’re also a symbol to your little one that it’s time to potty like a Big Kid. Going back and forth from diapers to pants only confuses him. Next, make the first time he pulls on a pair of Pull-Ups a symbol — a promise that you’re in it together and will work and learn together on your potty training journey.